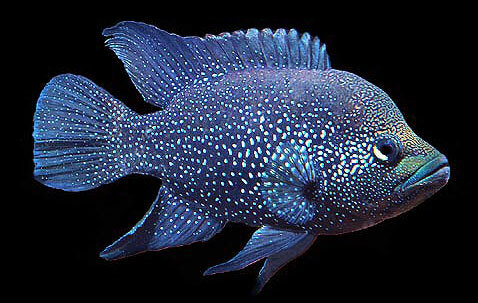 Adult Polleni Cichlids, and sub-adult dominant individuals are jet black in color, covered with brilliant iridescent spots which shift from golden to blue depending on the movement of the fish and the angle of the light. It has bright yellow eyes! This coloration makes them among the most beautiful and desirable of cichlids. They eat any and all commercial foods, flakes, pellets, frozen. Very rare. Although it is possible to breed Pollenis in aquariums. It is best to buy a group of young Pollenies and wait until they pair off. After that all the fishes except the paired should be moved to another aquarium. Pollenies are substrate spawners. The eggs hatch after 2 days. Black Diamonds are good parents and take care of their eggs and fry. After the fry starts to swim they can be fed any food small enough for them to eat. When breeding the male can become very aggressive towards the female. Sometimes you will have to move him to other tank. 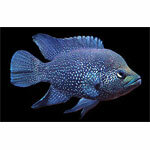 Can be kept with not too aggressive African cichlids, and even not aggressive American cichlids. A lot of hiding places are needed for this fish. The tank can be decorated with roots, pots and driftwood. Pollenies are sensitive to water changes. Males are larger than the females. Polleni males usually have more rounded head than the female.